When it comes to nostalgia, there will always be a group of people who would be more than willing to fork out top dollar in order to experience a precious memory from their past. If there was a particular movie franchise that certainly made us feel as though a time travel machine is the perfect thing to have this Christmas, then Back To The Future would be it. 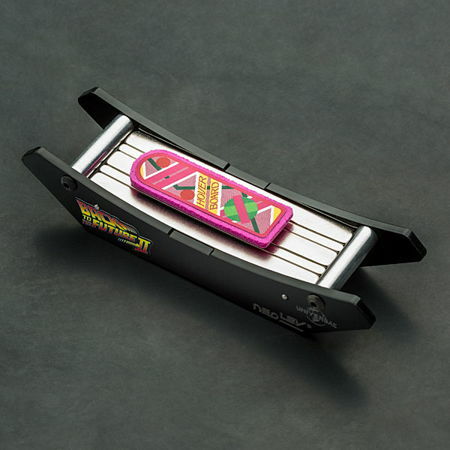 Here is something that might just keep friends of the franchise more than happy – with the $39.99 Back To The Future Desktop Hoverboards, of course. This will be different from other Back to the Future memorabilia that we have seen before, including the DeLorean Time Machine (which is non-functional, by the way), but at least it does have something connected to the franchise which will even continue to wow the masses today if it were to be realized. The pyrolytic graphite board actually hovers over the rare earth magnet base, where it will also do its bit to oscillate back and forth. Do bear in mind that this happens to be an officially licensed piece of Back to the Future merchandise, and makes for the perfect desk toy, accompanied by cool glowing edges to boot.